Grass choices for golf greens are crucial because the type of grass will inevitably affect the way the golf ball spins, as well as its direction and distance. Golf course grass types are specially selected with the golf game in mind, based on the grass texture and average cutting length. Grass types are also narrowed down for golf greens according to the climate in which the golf course is located. One of the most popular grass types for golf courses in cold-winter climates, bentgrass is commonly used in fairways, near tees and putting greens. Bentgrass is sometimes planted by itself in golf courses or mixed with Bermuda grass. This grass type has a fine texture and creates an “exhibition-level” lawn area. Bentgrass is rather high-maintenance, requiring frequent mowing, fertilization and watering, and the seed cost for establishment is also high. Bermuda grass is often planted around greens and tees. Bermuda is a warm-season grass that’s fine-textured with moderate maintenance demands, but it can thrive in drier environments. The improved varieties of Bermuda grass create an even higher-quality golf course green, but they’re also higher-maintenance and more expensive to establish. Also a warm-season grass, St. Augustine is planted on golf course greens and around tees. 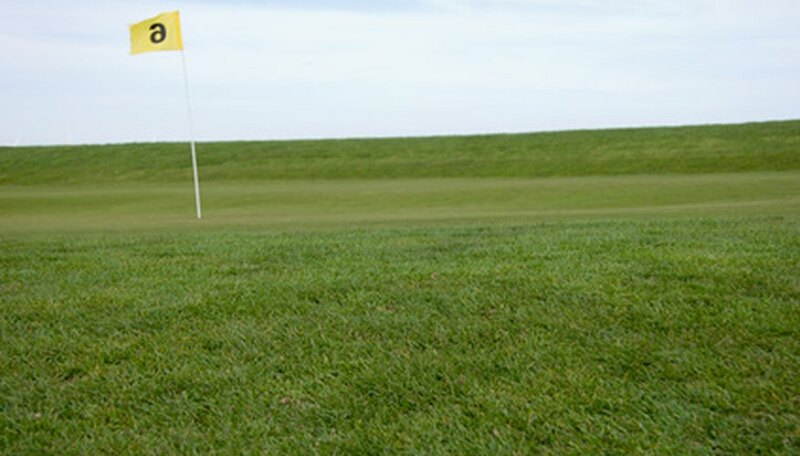 St. Augustine grass is coarse-textured, but some varieties that are used on golf courses are finer. With a moderate care level, St. Augustine is more commonly used in golf courses located in regions where temperatures are hotter in summer and humidity levels are high. St. Augustine grass is usually established using plugs, sprigs or sod, and not seed. Zoysia is planted on golf courses located in warm or cool climates, used around tees, greens and fairways. Zoysia is adaptable to a wide range of climates and has a medium to fine texture. Creating an exhibition-type grass area, Zoysia is high-maintenance and more expensive to establish from seed than some other comparable grass types. Commonly found in fairways and roughs, perennial ryegrass is a cool-season grass that’s also used on tennis courts. Ryegrasses have a medium texture and are the lowest-maintenance of all the grass types used on golf greens, but it’s also the lowest in quality. Annual ryegrasses are also used on golf greens, but they’re reserved for mixes or over-seeding during summer in colder climates and winters in warmer climates. Annual ryegrass has a finer texture and is low-maintenance.